Educational institutions: Ripon College is a private, four year liberal arts college with approximately 1,000 students. 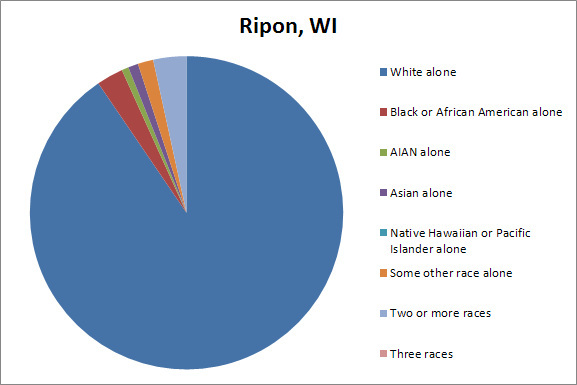 Ripon’s population is predominantly white, with a high number of households with incomes over $50,000. 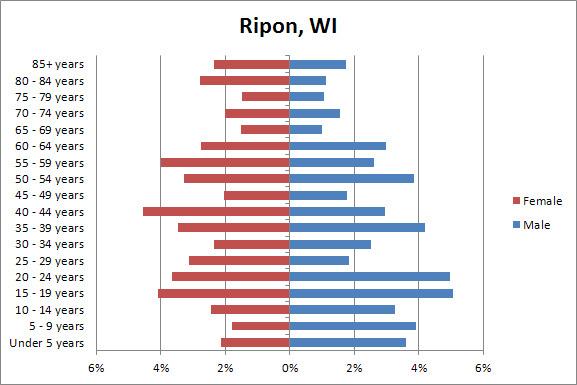 The presence of Ripon College increases the proportion of 20-24-year-olds within the City but much of the population is also older, predominantly between 40 and 60 years old. 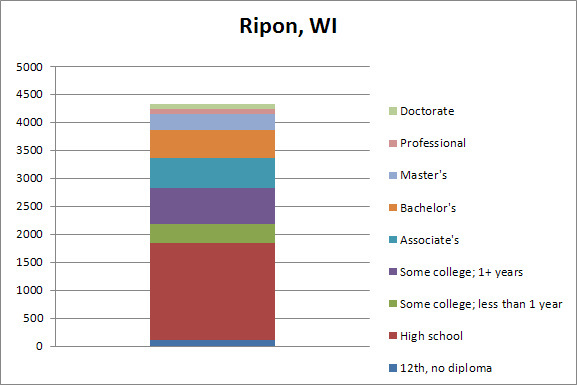 For the most part Ripon follows national trends in education levels; however, it has an increased number of people with higher degrees due to the presence of Ripon College. 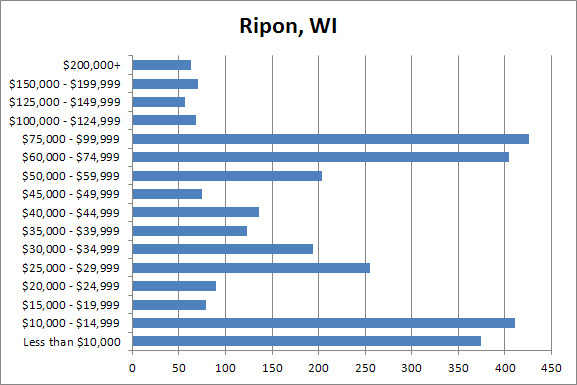 As with much of Wisconsin, Ripon is still heavily influenced by the manufacturing industry; Alliance Laundry Systems, Bremner-Ripon Foods and Smuckers are all major employers within Ripon (Ripon Main Street, 2007). Vision: Ripon is guided by a strong vision for how the city and the downtown will evolve in the coming decades. In 2007, the City of Ripon formulated “Go Ripon,” a downtown strategic plan to maintain and expand Ripon’s vibrant downtown district. Craig Tebon, Executive Director of the Ripon Main Street program, articulated a pragmatic and honest vision for downtown Ripon: quality construction, buildings rehabilitated to their original construction instead of showy “theme-park” buildings and a commitment to sound business practices (Tebon, 2011). Financial planning: According to Tebon, Ripon employs sound financial planning techniques to achieve successful outcomes in the downtown. For instance, it is often necessary to consult individually with businesses that are considering taking on additional loans for business improvements in order to ensure that they understand how interest rates and uncertain demand can affect the ability to repay loans. Tebon uses pro formas to guide business owners through the exercise of determining if a loan or grant is suitable for their investment, as well as offering free design services to help them make the best use of incentive financing. Part of this element is also what Tebon referred to as “picking the low-hanging fruit” by encouraging private investment where it is most obtainable. Division of labor: For a small town of only about 8,000 residents, Ripon has created a hierarchy to support its economic and community development strategies. In order to unify its multiple organizations, Ripon created the Ripon Economic Action and Development Implementation (READI) team to manage implementation of projects from concept to completion (Ripon Main Street, 2007). Click on charts to see more detail. Project priorities: Ripon has created a list of many action items that would all contribute to its vision of a better downtown. However, it succeeds by organizing these initiatives by level of impact and visibility. Projects that are “high visibility” are seen as a way to bolster community support; high impact projects can favorably change the market to encourage more development. Limited cost or zero political resistance projects are small and guaranteed successful projects that can be accomplished quickly and without obstacles (Ripon Main Street, 2007). Ripon focuses on projects that have noticeable payoffs in order to create a “snowball” effect of additional development and interest. Engaging businesses: Ripon empowers its downtown businesses through a Business Improvement District (BID) which assesses an additional annual tax – based on property value – on each business inside the district; revenues from this tax, when combined with funds from the city’s TIF district, can be used to make downtown improvements that benefit all businesses, such as street signage or landscaping. The BID is currently set at $3.35 per $1,000 of EAV (Tebon, 2011). Targeting college alumni: Part of the strategic plan for downtown Ripon involves creating housing for the alumni of Ripon College, empty nesters and retirees. Ripon has an older population that, as they begin to retire, may seek opportunities to divest themselves of large properties and move to smaller housing that suits an active adult lifestyle (Tebon, 2011). Ripon was named one of the “Coolest Small Towns in America” by Budget Travel Magazine, solidifying its appeal as a small town with the right amount of charms and amenities. Town-gown relations: In 2009, the Princeton Review ranked Ripon 3rd for community relationships with Ripon College (Princeton Review, 2009). The city and College have mutually agreed to seek ways to connect students to the downtown physically and culturally. The College expressed an increased desire for venues that students could frequent and both parties are interested in creating a visual corridor that connects the city and the College and creates a pedestrian path between both (Ripon Main Street, 2007). Additionally, students seem increasingly interested in stores that promote fair trade and organic products which already existed to serve the local market (Tebon, 2011). Zoning: Ripon’s central business district (B-1) has a defined list of uses permitted by right and a list of conditionally permitted uses, such as arcades, pawnshops and tattoo parlors; conditional uses may have imposed limitations on site design or operations (City of Ripon, 2011). Residential units are also permitted in commercial structures occupied by a business, so long as they provide a minimum usable floor area of no less than 600 square feet of floor area and two parking spaces. Purchasing At-Risk Structures: Ripon Main Street is capable of purchasing at-risk buildings in order to renovate them. Ripon Main Street acts as a ‘project manager’ that improves buildings before returning them to the private market for re-sale (Tebon, 2011).